Remember when Pokemon Go suddenly became a thing and idiots ran off cliffs, into trees, through hospitals, and across lanes of traffic, causing plenty of accidents? 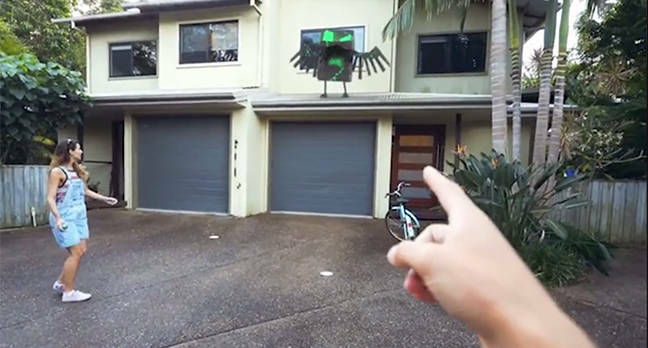 At the time it was hailed as the future of augmented reality – people seeing and catching imaginary creatures while out in the real world thanks to smartphone technology. Well, someone has figured out how to make it just that little bit more dangerous. Even better, it will no longer be just the people playing the creature-capturing video game that will put their physical safety at risk – thanks to an outfit called WRLDS, they will also be able to hurt you. The biz has a new product: an augmented reality and Bluetooth-enabled smart ball that you can throw in the real world to capture Pokemon in an imaginary world. "Just imagine playing Pokémon Go and actually throwing a real ball at the Pokémon rather than just staring at the screen," CEO Felix von Heland excitedly imagined. We can in fact imagine that. We can imagine walking in a park or along a street and suddenly being hit with a ball while some hipster whoops that he managed to catch a rare, imaginary made-up Japanese thing. "Thanks dude," he'll say picking up his ball as we check whether our retina is still attached. "Thought I'd lost it. These things cost forty bucks." He'd then pick up the Bird scooter he left in the middle of the sidewalk and zoom off. Or imagine your joy at hearing your bedroom window smash while someone reproduces the game that the company includes in its product video and tries to hit some kind of pixilated monster. What could be more fun? The ball itself is apparently made from "moon foam" and has a "bounce return rate of more than 70 percent" making it "one of the bounciest balls on the planet." Which will no doubt be comforting to know when it smacks into your driver side window as you go down the street, causing you to veer into a tree not made of moon foam. The ball itself contains a fair of amount of technology, carefully shielded from damage from an outer shell that will make short work of your child's face. There's an accelerometer that will detect movement, G-force and – crucially – impact. So you should be able to get real-time stats on how much it hurt. There's also an antenna, and a system-on-chip with Bluetooth electronics. Aside from the fact hurling real balls around in the real world while staring at a virtual version, we do wonder how useful this is really going to be. It's going to be quite hard – and frustrating – to look at a representation of the virtual world on a phone in your hand while also having to do something physical in the real world. Add balls to own face as you misjudge your effort to grab it while staring at your screen. The product video shows the ball leaving exciting virtual bounce marks as it hits real objects but without wearing an AR headset, we can imagine this getting boring quite quickly, even if, as the maker suggests, you could get it make virtual fart noises. If there is one upside to the idea it's that it could actually make the Magic Leap headset useful. The company has even adopted Magic Leap's own augmented reality approach of posting videos that appear to show its product in action but are actually special effects simulations.